I was expecting something big and epic when I began The Giver, so many people have recommended it to me that I figured it was something I would enjoy. Unfortunately, I was mistaken. The Giver is a really quick read at only 179 pages. And many readers have described it as the parent to modern day dystopian YA…but I failed to see what was so special. The Giver follows Jonas who lives in a Utopian community. After Jonas is selected to be the next Memory Keeper he begins to realize that his community isn’t the perfect place he thought it was and Jonas, with the help of The Giver, works to bring back the memories to the commune. I didn’t think it was a bad story by any means I just didn’t feel the breathtaking majesty other readers have described. I felt like The Giver was very basic and after the open ending I was left feeling very “meh” about the whole thing. The movie, I assume to appeal to a wider audience, changed the ages of the characters in The Giver. Instead of being eleven Jonas and his friends are around eighteen. This threw me at first but Brenton Thwaites, who plays Jonas, is a total hottie so I didn’t mind. I think some of the scenes though weren’t as powerful as they could have been because of Jonas’s age. The Giver movie began in black and white and ended in color. One of my favorite movies, Pleasantville, does something similar so this was my favorite thing about the movie. It really made the memory scenes more vivid. Overall, The Giver was a decent movie. It followed the book, although not exactly, and it had some pretty impressive actors (Alexander Skarsgard, Katie Holmes, & Meryl Streep). Still I wasn’t impressed by the storyline and I think some of my dislike of the book rubbed off on the movie and I thought the movie was only ok. I have heard about the movie, but never seen it. Love the actors in it, yeah the guy who plays Jonas is really hot! I have not quite decided about whether I should read the book (series) or not. Have it on my reading list on goodreads. I felt the same way about the book when I read it. I haven't had the chance to watch the movie yet, but I do love the fact that the characters are my age now instead of 11. What was special about the book is that it was one of the first YA dystopian books at the time of its publication. 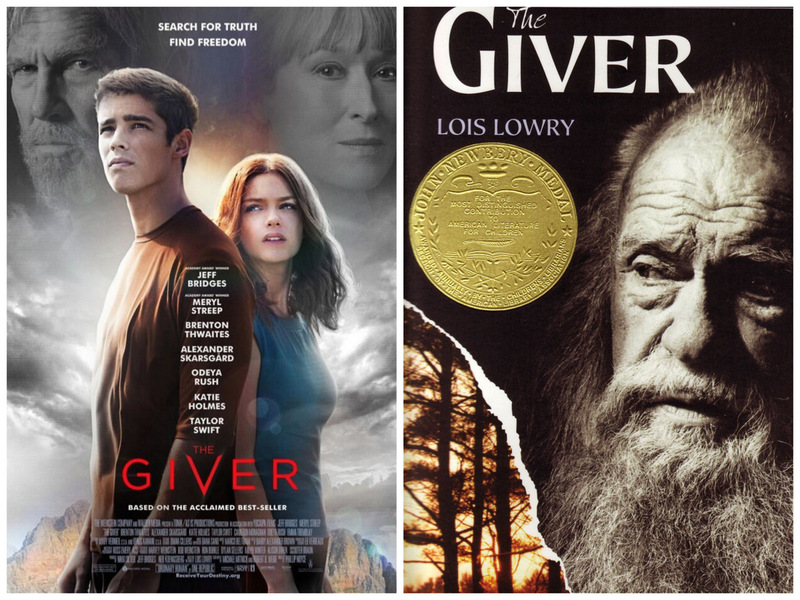 Now that the YA dystopian market is saturated, The Giver seems less special; however, it is thanks to books like The Giver that the YA dystopian genre first originated. *Sorry for the info dump! I've been researching for a blog post and this comment reminded me of some of that research. I have heard that there was a lot of differences in the book and movie. Like the age change and making some romance in it. I read the book when I was twelve, and I think that is the perfect time to read it. Any older and I think it sorta loses its magic. I still need to watch the movie though!